Jalon Valley Help is a voluntary organisation founded in 1992 and run by unpaid volunteers in order to help those in need within the Vall de Pop and the surrounding area, and to support local charities and organisations. We raise funds through our Charity shops in Jalón and Alcalalí, by donations and through regular events, such as the May Fayre, the Auction and the Christmas Bazaar. We use our funds to support those in need, and distribute some of the balance to local charities and organisations. More information is available on the website – www.jalonvalleyhelp.com – and also on our facebook page – www.facebook.com/jalonvalleyhelp. The May Fayre, which has been run every year for more than ten years, takes place in the Rastro Carpark in Jalon on a Sunday in May – in 2016 it is 15th May. 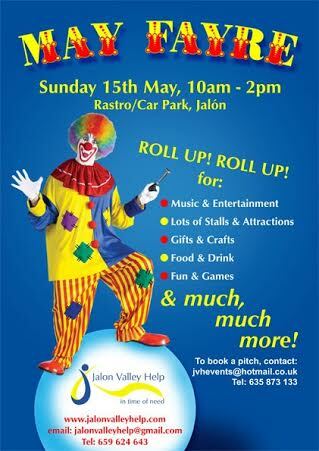 There are about a hundred stalls, many of them run by JVH’s own volunteers, but many belonging to local arts and craft people, businesses, and other charities who come along to support us every year. In addition there is music and entertainment – as this year’s theme is the Circus, we hope to see jugglers, clowns and acrobats, although we might draw the line at lion-tamers! And, of course, there is food! The men of JVH cook burgers and hot dogs over a barbecue and serve beer; the ladies cook cakes, scones and savouries and keep an enormous table full to the brim throughout the four hours of the event; many of the Spanish stalls, run by local schools and Amas de Casa, contribute equally large amounts of traditional Spanish baking; the Careline Theatre often send along a costumed party to add to the entertainment, and the stalls from the schools bring some of the children. There is always an enormous raffle, and the sale of the tickets contributes hundreds of euros to the funds. Last year, the net total raised for the event was in excess of 5,000€.